4 Minutes walk to Underground Station and located in a nice cosmopolitan part of London. Our unique aparthotel concept is for those looking for the benefits of a hotel and the homely atmosphere of an apartment. The flexistay solution is perfect for persons wishing to stay for one week or more. No 24 hours reception, please phone or email us at what time you are expected to arrive, latest check in: 21:00 without prior arrangement. All rooms have Sky TV with movie & sport channels. All rooms have private own en-suite.except the budget double room with, 3 nights minimum stay) All rooms have High Speed wireless Internet access, desk & chair and leather recliner for total comfort. Use of kitchen with cookware & utensils supplied, washer/dryer and a lounge area. All day breakfast is provided free of charge and is self-service! 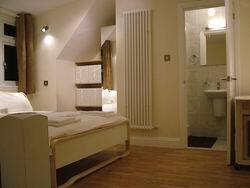 Flexistay provides very clean & well presented accommodation in London.